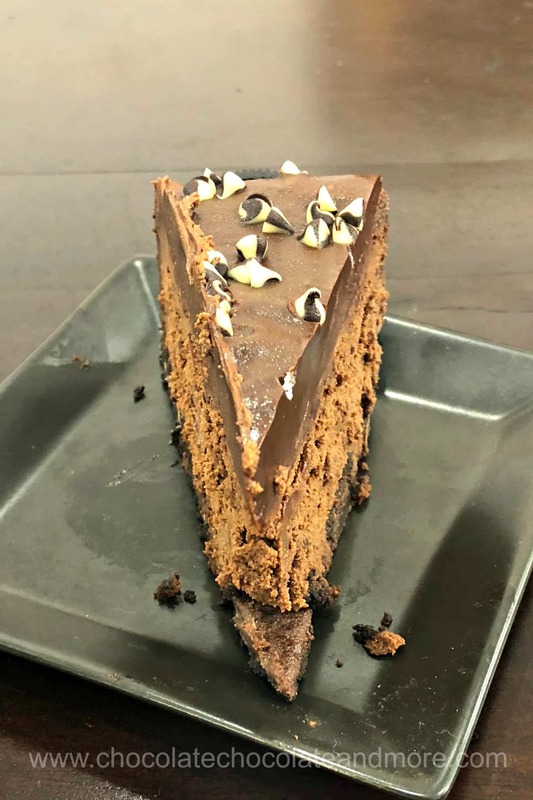 Chocolate Lover's Cheesecake - Chocolate Chocolate and More! 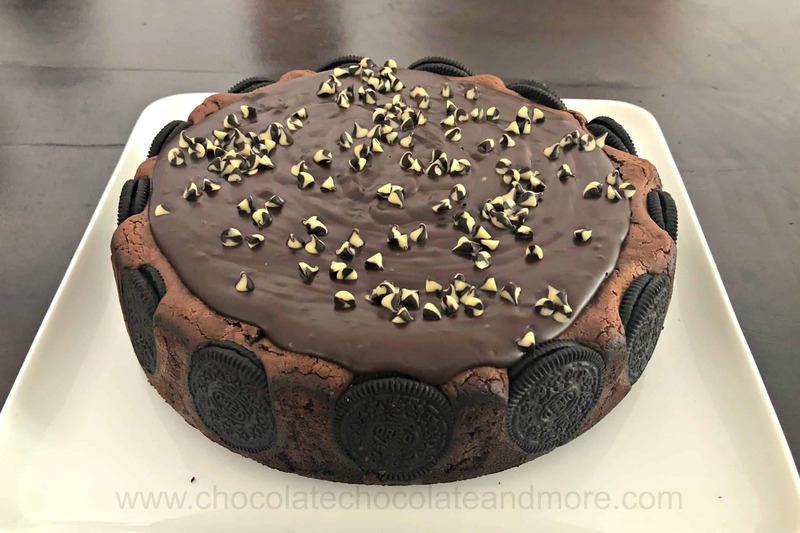 Fudge Oreo cookies surround creamy chocolate chocolate chip cheesecake. Top this with rich chocolate ganache and you’ll see why we call this Chocolate Lover’s Cheesecake! Today is my last day with an oven for 2 weeks. I’m moving out of my apartment tomorrow and donating my oven to a church. I’m pretty sure I’ll be experiencing some severe withdrawal symptoms by the end of next week. In the meantime, I need to use up the last of my ingredients. As you might expect, I’ve got quite a bit of chocolate on hand. Cookies, cocoa, chocolate chips, brownie mix, even some chocolate cereal. This recipe is an attempt to use as much chocolate as I can in a dessert to share with friends. Not that I wouldn’t have gotten around to making a chocolate lover’s cheesecake at some point. I mean, really – chocolate! I’ve already given my food processor to one of my friends so making a crushed cookie crust was out. I decided to just keep the Oreos whole. This also makes a nice decoration around the outside. The spaces between the Oreos on the bottom make nice holders for vertical Oreos on the sides. The melted chocolate provides most of the sugar in this cheesecake. If you’re worried about the flavor beat everything but the eggs together and then taste to see if the flavor is right. Then beat in the eggs. I had to freeze this to transport it to church in the Cambodian heat so there are some ice crystals on the slices. 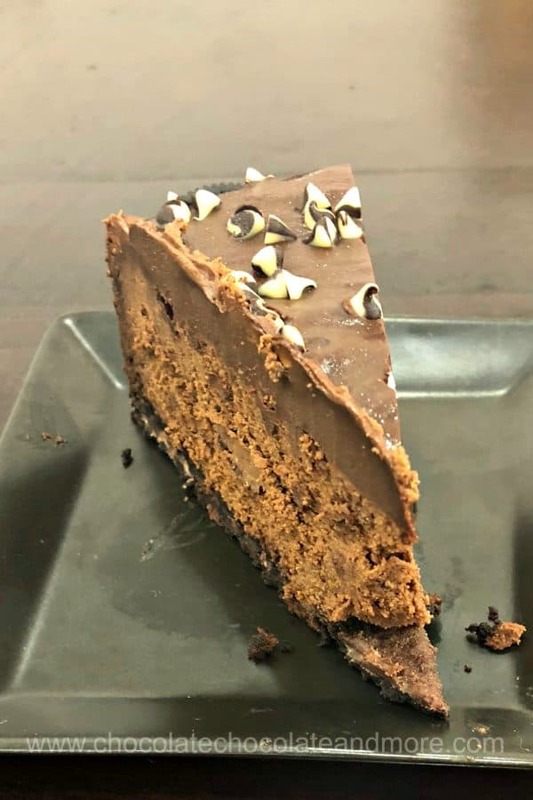 Chocolate lover’s cheesecake really does live up to its name. 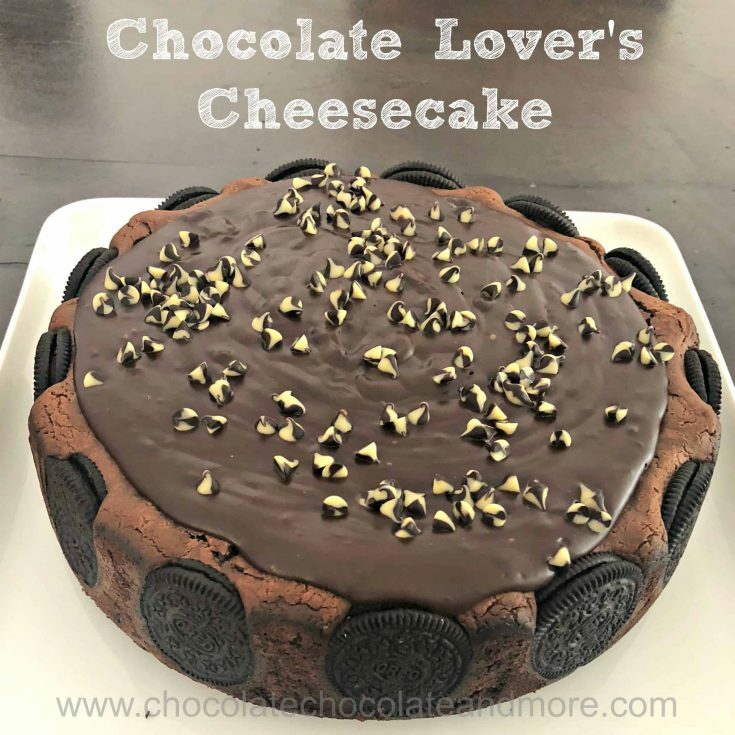 The fudge oreos made a wonderful crust and the creamy, rich chocolate cheesecake is absolutely drool-worthy. The chocolate ganache topping is the coup de grace. Just for fun, I sprinkled the top with some black and white chocolate chips. I hope you enjoy this chocolate lover’s cheesecake as much as we did. Line a the bottom of a 9" Springform pan with parchment paper. Then line the pan with whole Oreos. I put them around the outside first and worked my way in. Then I set the ones around the side in the spaces between the Oreos on the bottom. It's ok that there are spaces. Put filling ingredients in a mixing bowl and beat together until well mixed. Pour the batter into the prepared pan. Bake at 450°F for 10 minutes. Turn the oven down to 250°F and let some of the hot air out to drop the temperature. Bake for 30 minutes. Then turn the oven off and let the cake cool in the oven (about 2 hours). Heat the cream until it's steamy. Add the chocolate chips and let sit for 3-5 minutes before stirring. Stir until well mixed. Pour over top of cooled cake.